More than half (56%) of respondents to American Drycleaner’s Your Views survey this quarter indicate they provide extras such as beverages, food, snacks, entertainment, a comfortable waiting area and music. Also, more than half are in favor of extras, be it a piece of candy, a toy, a dog treat or a cup of coffee. 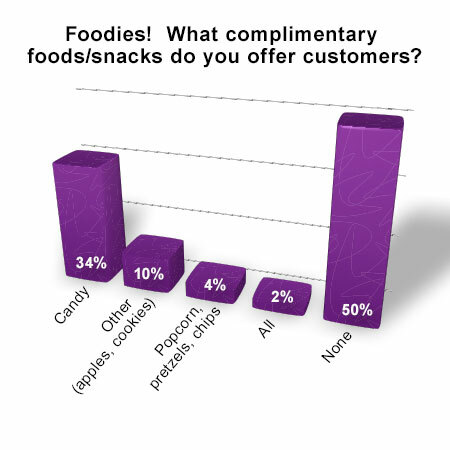 Of those who say they offer food, one-third (34%) give candy and 10% give seasonal items such as apples in the fall or cookies at holiday time. But half of dry cleaners who responded offer no food items at all. About beverages, 72% of survey respondents offer none. The 28% minority split their offerings between water and hot coffee/tea/chocolate. Concerning the waiting area, about one-third (32%) provide either tables/chairs or a lounge area, while 43% of survey respondents say their customers stand at the counter. “We have a small retail area,” writes one respondent. “Discount school cards,” writes another survey respondent about giveaways. 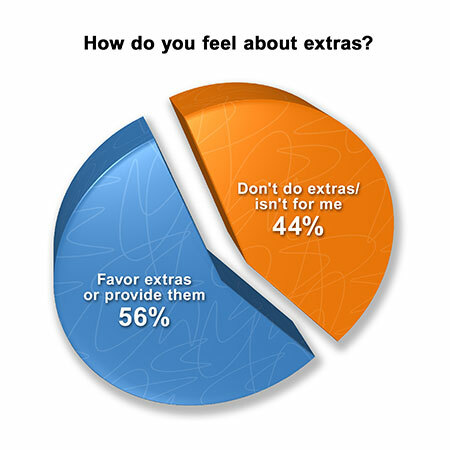 Overall, regarding how they feel about “extras,” 56% of survey respondents either favor extras or provide them. The remainder (44%) say they don’t do extras or it simply isn’t for them. The American Drycleaner Your Views survey is a snapshot of the audience’s views and should not be considered scientific. Qualified subscribers to American Drycleaner e-mails are invited to participate in a survey they can complete anonymously online.